Finally got this done! Simple 2 color dusty blue and grey made from Kaufman Essex Linen fabric, with soft and bright batting, made for a male family member. It has a bit of heft to it and I liked how it turned out, perhaps not the best quilting choice but I wanted to get it done, so in the interest of finished is better than perfect.......Oversized queen at 96x108, thanks for looking! I like it---good job ! It looks so warm and cuddly. Nice work. I am of the finished is better than perfect group a lot of the time....and if it is going to be used, just so it is quilted. This is so graphic, any guy would like it. I love your quilt. It’s very bold and dramatic. Is the pattern as simple as it appears - just alternate 4- patches and large HSTs? I love it! And I go for finished better than perfect every time! I like two color quilts & yours turned out really pretty. It's great for a man & I'm sure he will love it. Thanks for sharing it with us. I like the color selection, design and the quilting! If "Beauty is in the mind of the beholder" does that apply to quilting too? I think so. I like simple quilting to enhance a quilt and not overpower it. Too much quilting flattens a quilt and this looks puffy and inviting. I think I'm ready for a nap!! Really nice. Very handsome. Perfect for a male. Very pretty and I prefer the quilting. About how I do mine. Great 2 toned quilt-love the color choices! Great finish. 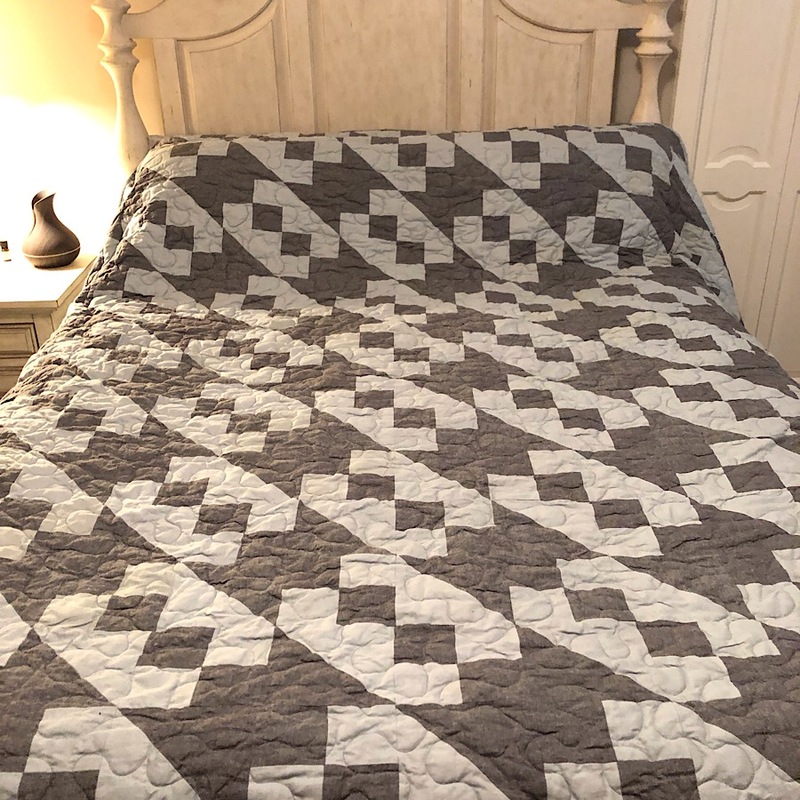 I’ve not done a two color quilt yet...but your pattern lends itself perfectly. Definitely masculine and wonderful colors. Great finish. I really like this. Simple and beautiful! Beautiful quilt and perfect quilting. Over quilting is pretty to look at but not comfortable to snuggle up under. It really turned out great. I hope he enjoys it!